The pick of the action as Guyana Amazon Warriors claim a two-wicket victory over holders Trinbago Knight Riders to reach the Caribbean Premier League final. 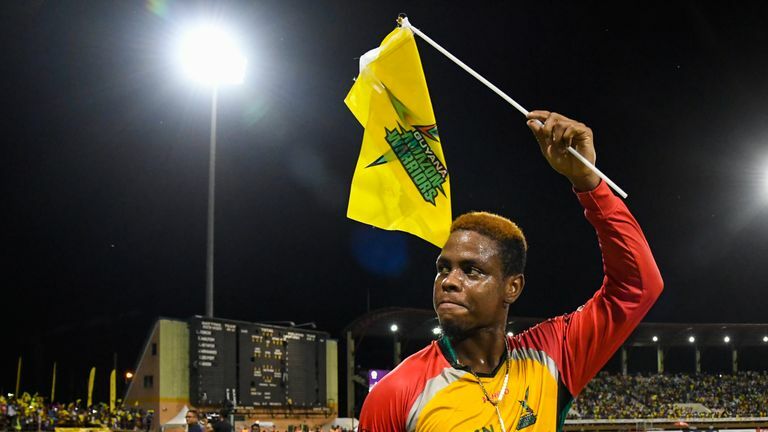 Shimron Hetmyer hit a decisive 39 as Guyana Amazon Warriors beat holders Trinbago Knight Riders in a low-scoring thriller to reach the Caribbean Premier League final. Put into bat first, the Knight Riders were sent into a twirl as they lost Brendon McCullum for a duck to Sohail Tanvir before Colin Munro was caught off spinner Chris Green without scoring. Green then had Sunil Narine caught at mid-off to reduce the visitors to 26-4, with the spinner finishing with exceptional figures of 2-8 from his four overs. With runs hard to come by, Colin Ingram (25), Darren Bravo (24) and Dwayne Bravo (22) all made contributions as last year's winners scraped to 122-7. Guyana's innings proved to be far from straightforward, as they lost regular wickets, and the match seemed to turn in Trinbago's favour when Chadwick Walton (13) was run out and Green was caught at first slip off Khary Pierre in the same over, as the Amazon Warriors slipped to 52-5 after 12 overs. But, Hetmyer and Sherfane Rutherford (30) shared an important 50-run sixth-wicket partnership off just 29 balls as they steered the hosts towards victory. There seemed to be one last twist in the tail when both batsmen were dismissed off consecutive balls but Tanvir smashed the penultimate ball of the innings for six.